SynDaver Labs designs and builds the world’s most sophisticated synthetic human tissues and body parts. SynDaver Synthetic Human bleeds, breathes, and employs hundreds of replaceable muscles, bones, organs, veins and arteries – all made from materials that mimic the mechanical, thermal, and physicochemical properties of live tissue. This validated technology is used to replace live animals, cadavers and even human patients in medical device studies, clinical training and surgical simulation. SynAtomy deluxe suturing kit is a great training platform for both advanced students and experienced professionals seeking to hone the skills associated with more advanced suturing and surgical procedures. 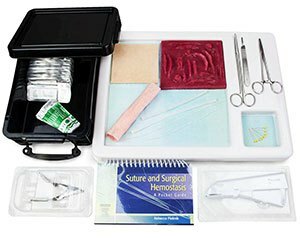 This complete kit includes a great instruction manual, instrument-quality suturing tools, industry-best SynTissue synthetic human tissues, surgical practice board, and a durable travel case.